ZAMBIANS, especially politicians, should learn to give credit to the Government when it is due following the appreciation of the Kwacha against the United States dollar, Chief Ntambu of the Lunda people of Mwinilunga district has said. He said when the local currency lost value, people blamed the Patriotic Front and that it was strange now that critics did not want to recognise the efforts of the Government which had resulted in the Kwacha gaining strength against the US dollar. He said in an interview in Solwezi yesterday that the appreciation of the Kwacha would bring about investor confidence and allow business firms to plan well for their investments in the country. “Personally, I am happy with the efforts Government has put in to strengthen the Kwacha because this will help the business community to plan for the future. ‘’However, it does not go without saying that people need to give credit and appreciation where it is due. When things are negative, Government is blamed. Subsequently, when things are positive, we must appreciate and give credit,” Chief Ntambu said. The traditional leader said Government must be commended on coming up with austerity measures that had helped to stabilise the local currency. “We must not be negative all the time. 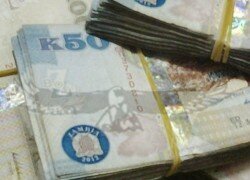 We have to commend this Government for the measures it has taken to stabilise the Kwacha,” Chief Ntambu said. And Chief Ntambu has thanked the Government through the Rural Electrification Authority (REA) for embarking on the construction of Kasanjiko hydro power station in his area. He said the project once completed would accelerate economic activities in the Ntambu chiefdom as investors would be encouraged to set up businesses in the area. “The Kasanjiko hydro power project is a dream come true for not only my chiefdom but also the entire Mwinilunga district. To this, I can only say thank you to Government,” he said.